Check out my fancy sticker! 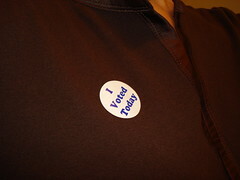 Yes, I actually did vote and earned my right to wear this cool sticky on my shirt today. Got yours? Vote! We vote by mail here in Oregon. No cute little stickers for us! But those of us who actually filled out our ballots before the mailing deadline, are also not the ones now sitting or standing in long lines waiting to drop them off today. So who did I vote to be our next President? Obama is my pick. Although, listening to Rush Limbaugh on the way home made me feel like a complete fool for doing so. But who cares about Rush Limbaugh’s opinion anyway. I voted bright and early this morning and I did not get a sticker! Who do I talk to about this gross oversight! Makes me all goosebumpy to see long lines and voting sites! YAY! long lines AT voting sites, I should say. @maksbestfriend – to each his (or ‘her’) own! Can’t wait to see how much the popular vote counts. The electoral college should be banished, IMHO. @ginabeana – this will make the history books, hence the goosebumps! Dare we ask your choice? Hhmmmm?? Hubby and I voted by mail several weeks ago in anticipation of being poll workers. I did, however, scrounge up a sticker for myself today. Would you believe we ran out of stickers TWICE!?! Being a poll worker was lots of fun. I’ll tell you all about it when my feet stop hurting and I’ve come down from the sugar rush from the goodies I bought at the bake sale. Polling place was at a church and the church ladies had a BAKE SALE! Voting and Chocolate – God Bless America! P.S. I voted for Obama. And you should take Rush with a grain of salt. I have to hope Obama is good for America, but I have grave concerns about how he plans to go about achieving his goals. But that is me. Maybe he will prove me wrong. I just don’t want to ended up poorer when he is finished with us. We work to hard for what we have now. And Rush is a jerk, IMHO. He made the news again today with comments about Obama being a ‘Chicago thug’. Someone needs to shut him up permanently. @maksbestfriend – I understand your concern. As a small business owner getting soaked in taxes under the Republicans, things just can’t get much worse for me there. I’m hopeful that Obama will look out for folks like myself. Im about a week late in responding, but Obama was my pick…you might have figured that out already form Facebook.